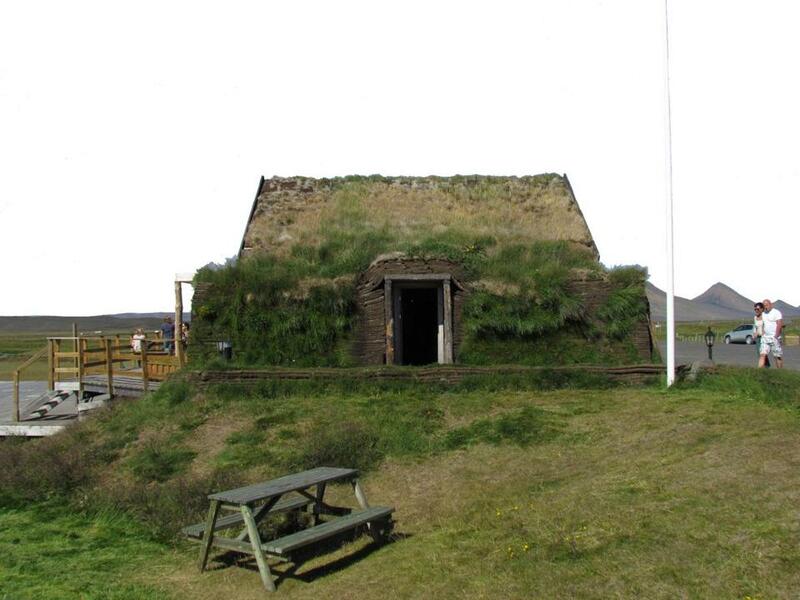 A turf house in Möðrudalur, Iceland, one of the inspirations for the proposed development. Residents would power their homes with solar energy, grow vegetables, tend livestock, and flush their toilets with recycled water in a proposed Newburyport housing project that offers a vision of environmentally sustainable living. The firm of Hall and Moskow plans to seek permits this fall for the town house-style rental development off Route 1. The green features would extend to nestling homes in a hillside to help insulate them from heat and cold, and a fleet of solar-and-pedal-powered vehicles that would be kept for resident use, according to David Hall, co-general partner of the firm with Keith Moskow. “The development is strongly geared toward saving energy that is normally used in food, transportation, and housing, and also water conservation,” Hall said of the project. The preliminary plan — at an estimate of $4.6 million including land acquisition and cleanup costs — calls for 24 units in a cluster of three pods. At least 20 percent of the town houses would be affordable. Two-bedroom town houses would rent for about $2,000 a month at market rates, with the affordable units renting for $1,300 to $1,400; utility bills would be greatly reduced because of the green energy features. Also as part of the effort to foster that sense of community, the firm plans to offer five-year leases for the housing units. Solar panels would occupy most south-facing pitched roof sections, with turf used on smaller, flat segments to intercept runoff, Hall added. Crops would be grown in three 4,000-square-foot greenhouses, and on an acre of land set aside for the purpose. Hall said he also envisions some farm animals, including a cow, chickens, and possibly goats and a pig. The firm would hire someone to manage the farming operation, but as with community-supported agriculture programs, residents could purchase shares of the yearly farm products or earn them through work. The products would be for the tenants, but any surplus could be sold. The use of ELF vehicles — a kind of electric car-bike hybrid manufactured by Organic Transit — would enable residents to get around without sending any pollution into the atmosphere. “Even if it’s raining, you could go to the convenience store to get milk, or to Shaw’s. Certainly, within Newburyport it serves all your needs,” Hall said. Going green is nothing new for Hall and Moskow, who own and manage 85 apartments and about 90,000 square feet of commercial space in Newburyport, including the Tannery Marketplace, a waterfront retail and office property built on a former contaminated factory site. ‘A lot of people are genuinely concerned about their footprints, and this empowers them to live in a way’ to soften them. The firm has installed 400 solar panels that generate most of the Tannery’s common area power needs. The complex also mandates recycling and composting by its commercial tenants, bales all cardboard waste, and was the first New England company to experiment with using computer-operated mirrors to melt piles of snow. It also founded and hosts a farmers market on the site. Hall and Moskow have had preliminary discussions with Newburyport officials about its latest project, which would be located on a vacant 4.9-acre site on Cottage Court, off Pond Street. The company, which bought the site in 2010, has spent three years preparing for the project by removing contaminated soils. About 3,200 tons of the dirt have been trucked from the site, according to Hall, who said most of the contamination was from coal ash apparently deposited by a farmer about a century ago. MassDevelopment, the state’s economic and development agency, last week announced it has awarded a $525,000 loan to the firm to help with the cleanup costs. Geordie Vining, senior project manager of planning and development, said the office “is supportive conceptually of what [Hall and Moskow Hall] are looking to do. Hall said the firm is confident its earth-friendly project would attract tenants. “A lot of people are genuinely concerned about their footprints, and this empowers them to live in a way that softens their footprints on the earth. It means something to people now,” said Hall, a Newbury resident. He said the firm is also looking for a way to link the site to the nearby Clipper City Rail Trail, the 1.1-mile multipurpose path that runs from the train station to the downtown. The planned rooftop solar arrays would generate about 2.5 kilowatts per unit. Hall said the goal is for the solar power, together with heavy insulation of the building exterior and the use of a cutting-edge heat exchange system, would enable the complex to meet all its energy needs. Hall said the recycling of “gray water” – water that has been used in showers, bathroom sinks, and laundry machines — would create a large source of water to use for toilets and lawn irrigation. Residents could minimize their trash volume by composting organic waste or feeding it to the livestock. “If I was raising a family there, I’d love it if my kids could take their table scraps after dinner down to the barn to give it to the chickens and the pig,” he said.